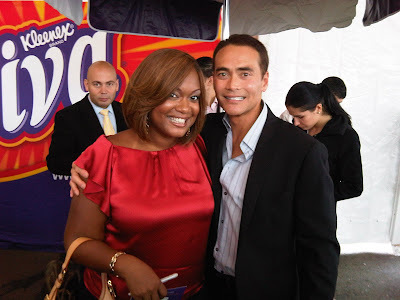 Sunny Anderson: NYC Wine n Food Fest - Look Who Likes My Ribs! NYC Wine n Food Fest - Look Who Likes My Ribs! Hey all! I've been a bit quiet because I was on vacation ... more on that later. I got back just in time for this past weekend's festivities here in NYC at the Wine and Food Festival ... I have more on that later as well, but just to give you an appetizer, here's a pic of me and The Chairman at my Viva ... Get Closer To Your Food booth at the Grand Tasting. Phew, ever come back from va-cay or stay-cay and hit the ground running with no de-lay?? Well, I feel like I'm sprinting ... with a smile on my face. :-) Stay tuned for pics and stories to go with my above mentioned 'laters' .... Until then if you have time to read, I found a fellow bloggers post about the Grand Tasting, take a look and enjoy your Monday! Ok Sunny, maybe he can make you the next Iron Chef and RR can make me the next Millionaire! Hehe! Yes! And, I just made a batch of burritos. Lol, my own recipe of course. Such the tease! That's pretty great. I'm loving him on Dancing with the Stars. I bet your ribs were awesome! That's so cool that you met The Chairman. Did he carry a pepper to chomp on? And isn't he on Dancing with the Stars this season, or was that a season or two ago? The Chairman! That's too funny. He was tearing your food UP. Wish we could've been in NYC! selenasking, teeheehee, no i'm just a cook! i'd need more than an hour, i like to relax in the kitchen. monique a.k.a. mo, i haven't caught an episode yet, but see the clips of tom delay on the soup, hilarious! he gave it a try though, gotta love his spirit! the duo dishes, he was 'goin in' as my friends and i say about doing something with a passion. we are giving away a trip to miami's festival with viva, check out the webpage and sign up, you can at least try to join me there! Must have been cool meeting Dacascos. I might have embarrassed him(maybe me too) by asking him about his role in "Brotherhood of the Wolf". Great foreign flick, personally speaking, probably his best work. NICE!!! I'm loving the Next Iron Chef at the moment (then again I'm biased because Jose Garces is my fave Philly chef). Sorry I couldn't head up to NYC this week - it's been chaotic with the move. Will be glad to get back to blogging. complaint dept. mgr., it was, very nice guy and seriously, he was eating my ribs like he really liked them! lys, moves are my specialty! the iron chef america booth was puttin out tha goods all weekend, it was all the way in the back, but worth the struggles through the crowd to get there! Missed seeing you in NYC. I did see a few of your friends at the Standard Hotel. Hopefully, I will see you in South Beach.